Historic Tribal Leaders Meeting in Washington, D.C.
On February 23, 2016, elected leaders from twelve Tribal Nations convened in Washington, D.C. and met in consultation with then Deputy Secretary Krysta Harden and Acting Deputy Secretary Michael Scuse of USDA, and Under Secretary Kevin Concannon and Deputy Under Secretary Katie Wilson of the Food, Nutrition and Consumer Services of USDA. The meeting brought together Chairmen, Chairwomen, Presidents, Governors, Tribal Chiefs, and Tribal Council Representatives to discuss the landscape of nutrition programs in Tribal communities. Jefferson Keel, Lieutenant Governor of the Chickasaw Nation of Oklahoma (pictured to the right), opened the meeting with a request to seat a working group of Tribal leaders to consult regularly with USDA. 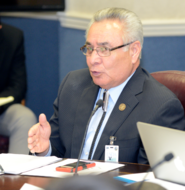 Lieutenant Governor Keel then opened the floor for his fellow Tribal leaders to speak directly to USDA leadership on what they view as the outstanding issues related to the Food Distribution Program on Indian Reservations (FDPIR) and the needs in Indian Country in general. Tribal leaders spoke passionately about FDPIR, the important role it plays, and the need and interest to look to improvements, both legislative and regulatory, for the program. The discussion also included increasing access to traditional foods in the food package, enhanced nutrition education opportunities, and the availability of more funding for local FDPIR operations. Tribal leaders, along with staff at USDA, are exploring options to continue the important dialogue in the future. Great-grandson, student, bookkeeper, father, FDPIR director, advocate, NAFDPIR president, storyteller – Red Gates has fulfilled many roles throughout his life, and his dedication and passion have catalyzed positive changes to FDPIR and the food package. Red, Program Director of the Food Distribution Program for the Standing Rock Sioux Tribe since 1982, shares his experience and memories for this edition of FDPIR Connection. The Standing Rock Sioux Reservation occupies 2.5 million acres in south-central North Dakota and north-central South Dakota. Standing Rock FDPIR serves nine communities and an average of 824 households each month, approximately 1,900 people. Approximately five truckloads of regular food and four truckloads of produce arrive each month, and participants may come to the warehouse to pick up their food any time. The program also offers tailgating, due to the size of the reservation, and home deliveries to eligible households, such as those who are elderly, handicapped, shut-in, or without transportation. Red recounted his childhood. Red’s mother died when he was four years old, and his great-grandparents raised him and his younger sister. His great-grandmother imparted to Red her spirituality and religion, and his great-grandfather passed along a strong work ethic: “If you can build it, build it. If you can fix it, fix it.” The family grew most of its own food in the garden. Red later attended boarding school and after graduating from high school moved to California, where he studied accounting and bookkeeping and got a job. A couple years later, a draft notice brought him back to North Dakota. Red began working for the tribe in 1969 as a bookkeeper, and in 1970, he was hired permanently and held different jobs related to finance, planning, and development. When the War on Poverty brought federal programs through the Office of Economic Opportunity and Office of Native American Programs, Red’s skills as a budget writer and planner served his tribe well. After the program Red worked on was later defunded, he was delegated to another program in trouble. The commodity program – which was ordering and distributing food without keeping proper records and submitting reports – was in danger of being turned over to the state of North Dakota. While Red thought that directing the commodity program was not his ideal job, he thought he’d try it out for a while. That was in February 1982, and 34 years later, he’s still there! Red went on to serve three additional terms as NAFDPIR President because he took over for three other Presidents who resigned. He is no longer on the national board but remains involved as a historian and on the marketing and legislative committees. His contributions include authoring the first resolution that created the Food Package Review committee, which has played a valuable role in improving the food package. Red’s understanding of business and marketing has further allowed him to appreciate the value of the food package. Red was instrumental in bringing pilot programs to his tribe. His starring role in a 1990 hearing on hunger – the House Select Committee on Hunger selected his tribe as one of the sites – earned him an invitation to a hunger forum from USDA Secretary Mike Espy. Conversations there prompted Red to ask participants what they would like to see, and the response was hamburger meat. Red wrote a paper about a pilot, and his tribe was selected as the pilot program for fresh frozen ground beef. Presaging the MyPlate advice to make half your plate fruits and vegetables, Red requested the addition of fresh fruits and vegetables such as apples, oranges, grapefruit, red potatoes, onions, and carrots to the food package at a June 1993 meeting with Food and Nutrition Service (FNS) leadership in Nebraska, and the pilot project for fresh fruit and vegetables for FDPIR was born. While popular foods vary among communities, Red highlighted several favorites among his clients: ground beef, bison, chicken breast, fresh produce, juices, seasonal items such as wild cherries, cheese, and cream of mushroom soup. Red is also optimistic about the new whole wheat tortillas because the clients really like tacos and burritos. His program hosts weekly food demos and provides handouts and cookbooks created by the Mountain Plains Nutrition Education committee. A new produce cookbook for seasonal food was distributed in May. What does the future hold, for Red and FDPIR? He doesn’t have in mind a date for retirement and feels there is more work to be done. At first he wasn’t convinced by the store concept, but he’s seen other tribes make it work and would like to stick around to see all the programs explore a store concept. Red never in his wildest dreams imagined he would be where he is today; he just wanted to help where he could and wasn’t afraid to ask challenging questions. He loves the program, understands the needs of the people, and appreciates all the support and mentoring that has guided him. As Red and his wife are now raising five grandchildren, he is fueled by a desire to provide food to kids who need it in the hopes that they will grow into healthy individuals. Red would like to give recognition to the Standing Rock Sioux Tribe and, especially, to the Standing Rock Sioux FDPIR staff for always supporting him and for taking care of the program’s most important services to the participating households. He also thanks his wife and family for their support as he has had to be away from home many times during his tenure with FDPIR, and he is grateful to his friends at USDA/FNS, other Tribes, and members of Congress who have provided encouragement, mentoring, and assistance. In the immediate future, he’s going to the NAFDPIR conference in early June, and will maybe have a few things to say there. We would expect nothing less from this passionate pioneer. June 2, 2016 – “Today, the Consumer Financial Protection Bureau unveiled a proposal for a new national rule on payday and car title lending that has the potential to save North Dakota residents millions if changes are made before the rule is finalized,” Lorraine Davis, Native American Development Center, Executive Director said. Payday and car title loans with interest rates that average 487 percent drain over $6 million in fees annually from the pockets of North Dakotans who can least afford it, according to a report by the Center for Responsible Lending. The North Dakota Economic Security and Prosperity Alliance (NDESPA), of which the ND AFL-CIO and the Native American Development Center are partners, and advocates around the country have been pushing for a rule that simply requires these lenders to do what any responsible lender does already – to determine whether a borrower is likely to be able to pay back the loan, without defaulting on basic necessities like rent and groceries, and without immediately taking out another loan. While the CFPB rule does create such an affordability standard, the rule also allows for too many exemptions and leaves open too many loopholes for that standard to meaningfully reduce the harm of predatory lending. The rule will be finalized in approximately 90 days. In the meantime, consumers are encouraged to comment and suggest changes to the final rule that will close loopholes and remove exemptions. Comments can be offered at stoppaydaypredators.org/ndespa. On Thursday, June 2, the day the Consumer Financial Protection Bureau (CFPB) unveils its proposal to regulate payday lending, local faith, community and consumer leaders will release new data on how much money is drained from North Dakota communities as a result of these predatory practices. The rule, if done well, could rein in the worst abuses of payday and car title lending nationally, shutting the debt trap and leaving room in the marketplace for responsible small dollar lending. “Payday Lending companies, under the current lack of regulation, are no better than loan sharks. These institutions prey on the poorest and most vulnerable of our citizens, enriching themselves on the desperation of others. We are at a moment in time when we can do the moral thing and sensibly regulate these businesses and protect people from the predatory habits of these lenders,” said Waylon Hedegaard of the ND AFL-CIO. Advocates say the initial draft of the CFPB rule, which requires payday lenders to make affordable loans, is a step in the right direction but that loopholes and exemptions must be removed for it to truly be effective. The rule will be finalized after a public comment period of approximately 90 days. WHEN: Thursday, June 2 at 9:15am CDT. WHAT: Press call to release new data on payday and car title lending in North Dakota, respond to CFPB proposed national rule released the same day.